“The systematic consideration of all relevant costs and revenues associated with the acquisition and ownership of an asset”. Principally, whole life costing can be characterised as a systematic approach balancing capital with revenue costs to achieve an optimum solution over a buildings whole life. This technique, whilst not in itself new, has over recent years become best practice in construction procurement. Whole life costing can be used at any stage of the procurement process, and can be used at the levels of facility, function, system and component.Both capital and revenue costs must be considered over the whole life of the building in the form of annualised cash-flows. This includes everything from initial design to end of life. Where does whole life costs fit in? Whole life costing can be combined with environmental or other targets, and can be used to validate a more sustainable approach, by quantifying the cost of complying with current and future environmental legislation. As such, whole life costing forms a critical step for organisations wishing to move towards sustainability. 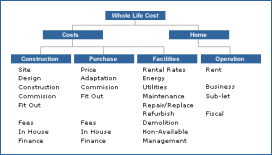 Although much of the recent promotion of whole life costing focuses on the role of the ‘construction client’, and emphasises the gains to be made on their behalf, whole life costing is a beneficial tool for organisations involved at all stages in the construction supply chain. Being part of a supply chain which holds whole life costing as a core process supports the development of supplier, contractor and manufacturer organisations. However, whole life costing does carry some risks. It requires a new set of skills that may be lacking in any part of the supply chain, and clients themselves are often unable to adequately describe how they expect the building or asset to be used, although construction clients are pushing for whole life costed project plans, they may be unable to interpret these correctly themselves. There is a clear requirement for considerable training in whole life costing across the whole of the construction industry, and particularly within the design professions. .Also, whole life costing requires a different way of thinking about cash, assets and cash-flow. The traditional capital cost focus has to be altered, and costs be thought of in terms of capital and revenue costs coming from the same ‘pot’. Many organisations are simply not geared up for this adjustment. The common misconception that a whole life costed project will always be a project with higher capital costs does not assist this state of affairs. As building services carries a high proportion of the capital cost of most construction projects, this is of particular importance. Conversely, it can easily be seen that whole life costing can contribute significantly to the achievement of the financial and non-financial business objectives of many construction, and construction client, organisations. This is especially relevant in terms of customer service, internal business processes, and financial performance. Furthermore, the process is fundamental in moving towards sustainability in construction, as this industry still requires that monetary values be placed on the non-financial elements of sustainable development. Whilst whole life costing is a fairly simple and well-understood mathematical process it is a difficult concept for many to grasp, requiring a significant change of focus, and the difficulty of implementing it adequately, and the wider risks to business should not be underestimated. There are many spreadsheet-based methods available to calculate whole life cost using discounted cash-flows. Unfortunately they are open to misinterpretation and to direct manipulation leading to uncertainty and unreliability of the output and any comparisons used to select between competing products or suppliers. This is where the WLCF tool is particularly useful – taking uncertainties out of the process and providing organisations wish a simple and secure and comparable process by which to carry out WLC. The WLCF tool is designed for use by people who have never considered WLC before and by experienced practitioners alike.